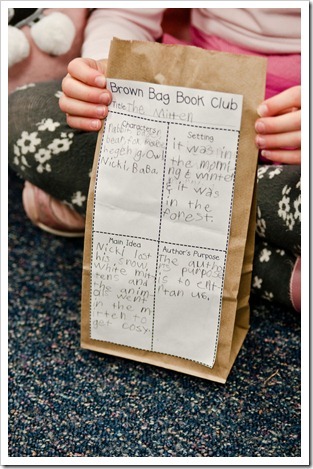 Have a mini book club in your classroom via The First Grade Parade! At the beginning of each week, Mrs. Carroll reads a book to her class. Next, she has them fill out information about the book that helps get their discussion going during the book club session (e.g. favorite character, alternate endings, and how they can relate themselves to the story). Then, they tack their info on a brown lunch bag. When Friday comes around, the bags are filled with popcorn and the book club begins! Kids are separated into small groups, encouraged to chat it up!